The Dutch Safety Board investigated two serious incidents involving an insufficient thrust setting for take-off that occurred with the same operator, Transavia. Besides the insufficient thrust setting, the calculated take-off speeds were invalid. In both incidents the required safety margins for take-off performance were not met, increasing the risk of a runway overrun, tail strike and a collision with an obstacle after departure. During the first serious incident (2014) the operator made use of manual performance calculations, whilst the second serious incident (2015) occurred after the operator had introduced digital performance calculations on an Electronic Flight Bag (EFB). On September 18, 2014 a Boeing 737-800 started its take-off at Groningen Airport Eelde, the Netherlands, for a domestic flight to Rotterdam The Hague Airport. During the take-off roll the pilots became aware that the acceleration was less than expected. The take-off was continued. The take-off weight used for the performance calculation was 10 tonnes too low due to a miscalculation of the take-off weight on the take-off data card (bugcard) by the flight crew. As a consequence the selected take-off thrust was lower than required. Approximately 60 metres before the end of the runway the aircraft became airborne. On December 3, 2015, a Boeing 737-800 departed from Lisbon Airport, Portugal, to Amsterdam-Schiphol Airport, the Netherlands. The pilots noticed that the remaining runway length was less than expected during the take-off roll, shortly prior to rotation. The take-off was continued. Approximately 430 metres before the end of the runway the aircraft became airborne. 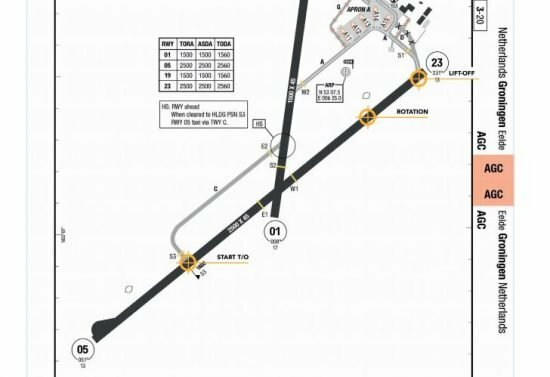 The take-off performance in Lisbon was calculated for an incorrect runway/take-off position combination due to an EFB input error, which was possible due to unclear naming of take-off positions at Lisbon Airport. As a consequence the available runway length was 1,120 metres less than calculated. A common factor in both incidents was that the errors could propagate, because there were no adequate crosschecks in place to detect the specific errors made by the flight crew. A crosscheck detecting the erroneous take-off weight on the bugcard was lacking in the Groningen incident. A crosscheck detecting that both pilots were making the same runway selection error was lacking in the Lisbon incident. Another common factor in both incidents was that the flight crew did not select additional thrust after realizing the take-off roll was unusually long. The operator stated in an internal investigation report into data entry errors (completed on October 1st, 2014) that the existing crosschecking policy could be inadequate. However, the report did not formulate recommendations to include the bugcard in a crosscheck. The operator’s manual load and trim procedure, including the use of the bugcard, was not reviewed after the Groningen incident, although, the manual load and trim procedure is still in place as a back-up in case of an EFB failure. When the operator carried out the risk assessment for the introduction of the EFB, they did not perform a risk assessment for the software that would be installed on the EFB because it was not yet available at the time the risk assessment was performed. Besides that, the operator did not perform an internal investigation into the causes of data entry errors on the EFB when it became apparent from continuously monitoring that data entry errors are regularly made in the operation. The development of new and independent monitoring systems, aimed to provide flight crews with a timely warning that the required take-off performance cannot be achieved, is slow. EASA has not classified the development of the regulatory framework of these systems as a high priority due to a low amount of fatalities in take-off performance related incidents. The Dutch Safety Board is of the opinion that such systems have a high likelihood of preventing serious take-off performance incidents. The development of specifications and the establishment of requirements for Onboard Weight and Balance Systems should be prioritized and the development of specifications and the establishment of requirements for Take-off Performance Monitoring Systems should be started without further delay.